East side of 200 block of South McAlpin Street, 1960, showing land recently cleared on McAlpin Street and demolition-in-progress on the south side of 3600 Walnut Street. In the background are the buildings on the north side of Walnut Street, the three-story 3625 Walnut Street at the extreme left margin and the one-story, commercial garages at 3613-23 Walnut at center left. Donated to the University Archives in July 1996 (Accession No. 1996:88). The collection is arranged into two series, Album One and Album Two. Each series is arranged by the original page or image number. Raymond C. Saalbach was graduated from the University of Pennsylvania in 1949 with an A.M. in English. After graduation he embarked on a long career with the University. In 1949 he became the Assistant in the Admissions Office. A few years later he was appointed as the field representative of the Admissions Office. From 1957 to 1960 he served as Vice-Dean of Admissions. In 1964 he became Director of Admissions of the Graduate Division of the Wharton School of Finance and Commerce. After a brief period as the Training and Communications Officer in the Personnel Office, Saalbach joined the Development Department in 1969. At the time of his retirement in 1981, Saalbach was the Assistant Director of Annual Giving. In addition to a long and varied administrative career, Saalbach also received two degrees while working at the University-a M.S. in Education (1950) and a Doctor of Education (1952). This is a photograph collection of about 200 images which document several major building activities on the University of Pennsylvania campus during the early 1960s. The first half of Album One contains informal snapshots of staff members of the Office of Student Financial Aid sometime in the mid-1960s. The remainder of the collection is images of new buildings and construction which occurred during the University’s period of greatest physical expansion. Prominent among these are photographs of the Annenberg School of Communication, Van Pelt and Dietrich Libraries, and the School of Education and Social Science Center. There are several views of the sites of the new buildings prior to the demolition of the pre-existing structures. In addition to the images of new buildings, there are several photographs of the older University buildings. All of the photographs are numbered and the images in Album Two are all dated. The collection consists entirely of color prints varying in size from 3.5 by 3.5 inches to 6.25 by 9.25 inches. Original negatives can be found for almost every image in the collection. p. 1: Photographs of Sophie Shminlur, Pat Poiesz, Leah Chavis, Katherine Sandroni, Gene Gisburne, Evelyn Mann. p. 2a: Photographs of Margaret Ross, Dave Purcell, Joyce Windle, Virginia Hewlings, Ken Mortimer. p. 2b: Includes photograph of Frank Betts. p. 3a: Photographs of Carol Nase, George Schlekat, Pat Lavery, Gloria Jones, Steve Spruance, Edith Roberts. p. 3b: Photographs of Jack Cleveland, Lillian Crawford, Joseph Collins, Ted Scovel, Miriam Berg. p. 4a: Photographs of Dave Purcell, Bill Houpt, Ed Wolfe, Peg Murphy. p. 4b: Includes of photographs of Hilda Bannat, George Koval, Jean Verlenden. p. 5a: Photographs of Ron Ryan, Pat Polianski, Henry Clay, James Shada, Micki Spillner. p. 5b: Photographs of Lindsay Redway, Marilyn Morrison, Charles Eddy, Lurlene Berry, Carol Crow. p. 6a: Photographs of Neal Shaffer, Dorothy Fidler, Ervin Miller, James Yarnall, Eleanor Aylmer. p. 6b: Photographs of James Murdock, Jacob Northrop, Lillian McCabe, Philip Moore. p. 7a and 7b: Unidentified snapshots. p. 8b: Photographs of Barbara Hill, Susan Croll, Dan Vanbuskirk, James Beermann, William Bestimt. p. 9a: Photographs of Jack Russel, Joan White, Sally Sensing, Ruth Hemphill. 12. a. Medical Research Tower from Botanical Gardens; b. College Hall, 19 June 1961. 13. A. Homecoming, Navy Game, Franklin Field, 22 October 1960; b. University Camp for Boys, Green Lane, 2 September 1961. 14. A. Provosts’ Tower, 10 September 1961; b, Irvine Auditorium and Houston Hall, 9 December 1961. 15. A. Dietrich Library, 10 July 1967; b. Women’s Residence from Walnut and 33rd. 16. A. Law School addition (Law School dorms and English House in background), 9 December 1961; b. Law School, 17 December 1960. 17. A. Schuylkill River (frozen) and Expressway, looking south from Walnut Street Bridge, 5 February 1961; b. Hutchinson Gym and Palestra from 30th and Walnut. 18. A. College Hall, 16 April 1962; b, Logan Hall. 20. A. Macfarlane Hall on its last day of service, 2 January 1964; b. Macfarlane Hall with new biology building behind, 4 January 1964. 21. A. New biology building under construction, 19 October 1962; b. New biology building from Botanical Gardens, 16 May 1963. 22. A. The last of the Macfarlane Hall, 12 February 1964; b. The same scene some months later, 4 July 1964. 23. A. New Law School courtyard, 13 July 1963; b. School of Social Work, 2410 Pine Street. 24. A. Veterinary School addition under construction, 16 May 1963; b. Veterinary School addition nearing completion. 25. A. University Museum from upper deck, Franklin Field, 28 September 1963; b. Weightman Hall from upper deck, Franklin Field. 26. A. & b. Site of new athletic facility (3709 Walnut Street), 28 November 1963. 27. A. Materials sciences building under construction, 16 May 1963; b. Fast progress on the Materials Science Building, 15 December 1963. 28. A. Mayer Dorm under construction, 28 November 1963; b. Tabernacle United Presbyterian Church (UCC) Church, 28 November 1963. 29. A. Site of first house (38th and Woodland); b. Site cleared (in use as parking lot). 30. A. Dietrich Library, 9 July 1967; b. Houston Hall plaza after snow, 14 January 1964. 31. A. & b. Site of graduate library, 15 December 1963. 32. A. Dietrich Library, 1 January 1965; b. Graduate electrical engineering laboratories, 16 April 1967. 33. A. Social Science quad, student lounge, 11 June 1966; b. The “old House,” New Bolton Center, 14 June 1964. 34. A. New clinical headquarters (from bouncing hay wagon); b. Animal recuperation buildings. 35. A. & b. Junior balcony and Triangle after a snow, February 1964. 36. A. Dietrich Hall, west elevation, with magnolias, 11 April 1964; b. The new parking garage, 12 April 1964. 37. A. & b. South side of Walnut Street west of 37th before redevelopment, 9 December 1961. 38. A. & b. Clearing site for School of Education and Social Science Center, 22 April and 12 April 1963. 39. A. & b. Cleared site, 4 July 1963. 40. A. & b. Work begins on the Social Science Center, 15 December 1963. 41. A. & b. Progress on the Social Sciences Center, 4 July 1964. 42. A. & b. School of Education framework takes shape, 1 September 1964. 43. A. & b. Completed brickwork on School of Education, 11 April 1965. 44. A. School of Education, Walnut Street side, 11 June 1966; b. School of Education, courtyard side. 45. A. Work under way on Locust Walk, Summer 1964; b. Same scene, completed, 31 May 1965. 46. A. PTC rotunda under construction, 11 April 1964; b. The same temporarily completed and operative, 26 October 1964. 47. A. The remains of 3709 Walnut Street, 23 August 1965; b. New Gym takes shape, 21 August 1966. 48. A & b. Site of General Services building, 19 October 1965. 49. A. 3729 Locust St. (next to white house), 28 October 1967; b. Temporary University Book Store, 31 August 1968. 50. A. Phi Kappa Sig, Du, Delta, and Beta, 25 November 1967. 51. A. Palestra from Franklin Field, 25 November 1967; b. Skating rink beginning to take shape, 18 May 1969. 52. A. The aircraft carrier, 24 December 1968. 53. A. The Franklin Building, 24 December 1968. 54. A. & b. Northwest corner of 37th and Spruce Streets, 15 June 1968. 55. A. & b. Hare Building, 14 June 1968. 56. A. & b. Victoria Apartments from parking lot, 38th and Spruce, 7 April 1969. 57. A. & b. Southeast corner, 37th and Chestnut Streets, 21 July 1968. 58. A. & b. The MBA House, Northwest corner of 39th and Locust, 30 May 1969. 59. A. & b. 3900 block of Spruce Street from 39th Street. 60. A. Southwest corner, 39th and Locust Streets, 11 August 1968; b. St. Mary’s, south side of Locust east of 40th. 61. A. Southeast corner, 40th and Locust Streets, 11 August 1968; b. Northeast corner, 40th and Spruce Streets. 62. A. Southwest corner, 38th and Locust Streets, 12 August 1968; b. Southeast corner, 39th and Locust Streets. 63. A. Northwest corner, 38th and Spruce looking west of Spruce, 31 August 1968; b. Same corner looking north on 38th St.
64. A. Southwest corner, 40th and Locust Streets, looking south on 40th Street, 28 November 1968; b. Northwest corner, 40th and Locust Streets, looking north on 40th Street. 65. A. & b. 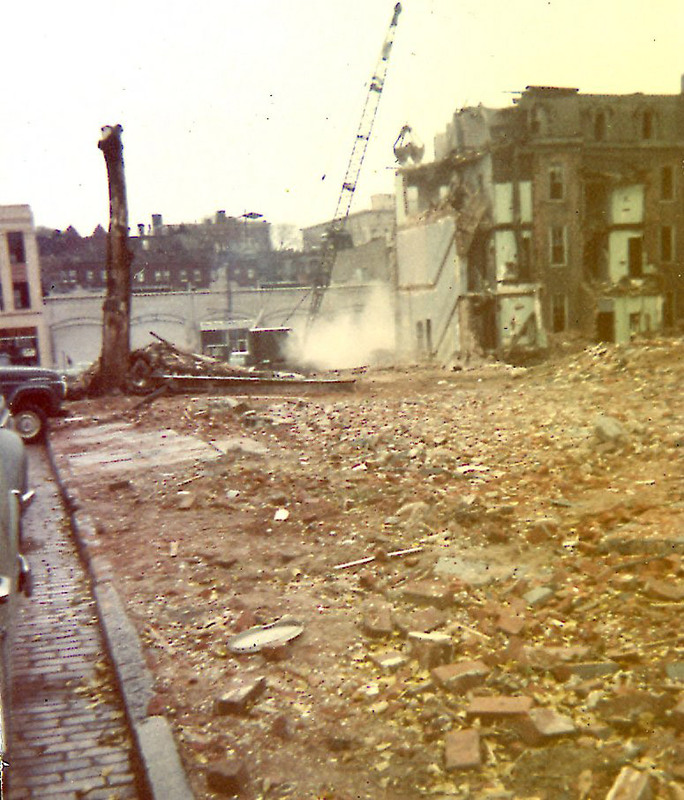 Northeast corner, 37th and Walnut Streets, just after demolition of Record Mart and Walvania Apartments, 4 January 1969. 66. A. New Social Science building from Newman Hall parking lot, 7 April 1969; b. Record Mart and Walvania before demolition, 15 June 1968. 67. A. & b. New residence, northwest corner of 39th and Spruce Streets, 7 April 1969. 68. A. West side of 38th Street above Locust, 7 June 1969; b. Corner of 38th and Walnut Streets, showing Eisenlohr Annex. 69. A. South side of Walnut Street from 39th, showing Fels and Eisenlohr; b. South side of Walnut Street west of 39th, showing ATO. 70. A. South side of Walnut Street, west of 39th, showing Illman; 40th Street south of Walnut, showing library and American Legion. 71. A. North side of Locust Street, east of 40th; b. North side of Locust Street, west of 39th (from MBA House). 72. A. North side of Locust Street, east of 39th showing KKG; b. North side of Locust Street, west of 38th showing KA and Chaplain’s house.